Christopher Boone is an autistic savant with little understanding of human emotions. When a dog in his neighborhood is murdered, he sets out to solve the mystery – but the investigation leads him down some unexpected paths and ultimately brings him face to face with the dissolution of his parents’ marriage. Mr. Haddon has deliberately created a story defined and limited by his hero's very logical, literal-minded point of view. The result is a minimalistic narrative – not unlike a Raymond Carver story in its refusal to speculate, impute motive or perform emotional embroidery … Christopher's detective work eventually takes him on a frightening trip to London, a trip that Mr. Haddon makes us experience from the boy's point of view as a harrowing adventure, as scary as anything in an action thriller. And it also leads to an unraveling of his own family's past … Christopher emerges as a wonderfully vivid individual. He never for a moment feels like a generic teenager or a composite portrait of someone with Asperger's syndrome. 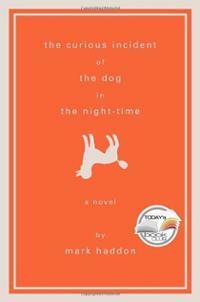 The Curious Incident of the Dog in the Night-Time is presented as a detective story. But it eschews most of the furnishings of high-literary enterprise as well as the conventions of genre, disorienting and reorienting the reader to devastating effect … Christopher tells us all we need to know about his condition without reference to medical terminology – just as well, since the term ‘autism’ encompasses a variety of symptoms and behavioral problems that are still baffling behavioral scientists … One of the subtle ironies of the book is that young Christopher is ultimately far more hard-boiled than any gumshoe in previous detective fiction...Christopher's skewed perspective and fierce logic make him a superb straight man, if not necessarily a stellar detective … The gulf between Christopher and his parents, between Christopher and the rest of us, remains immense and mysterious. And that gulf is ultimately the source of this novel's haunting impact. Haddon has taken on a Herculean task: using the prism of autism, a condition in which, according to popular notion, a person cannot comprehend emotion. Yet through the smoke and mirrors of his character's oddly dispassionate view of the world around him, Haddon manages to rouse intense and devoted interest … Christopher lives in a world of facts and figures, cool decipherings of the complex and baffling world around him. Subtle gradations of emotion confuse him; straightforward logistics soothes him. … Although the book is character-driven, it also contains a rich plot. It is a murder mystery, a road atlas, a postmodern canvas of modern sensory overload, a coming-of-age journal and lastly a really affecting look at the grainy inconsistency of parental and romantic love and its failures. What did you think of The Curious Incident of the Dog in the Night-Time?